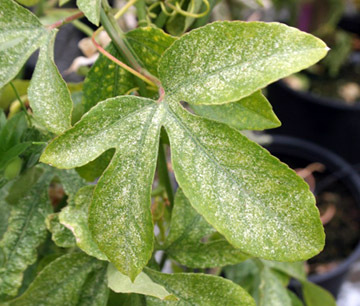 Twospotted Spider Mites are a summer problem for many trees and shrubs and also to flowers, vegetable garden plants, even weeds. They are more common than people realized and go unseen being so small. They feed upon the plant juices inside leaves and soft stems. Mites are very tiny. Most cannot easily be seen on plants with the naked eye unless you have really sharp vision. It takes a magnifier to be able to see them and make a positive identification. The damage they cause is also a helpful sign in narrowing down the culprit responsible. Spider mites get their name, in part, because they spin small webs on the underside of leaves or on branches near the leaves. These literally look like tiny spider webs, but spiders do not damage the plants. These tiny webs are an important sign of mite presence. The damage to the leaves will also be in the direct area of the webs. Look on the plant edges along the line of damaged area and the undamaged areas. 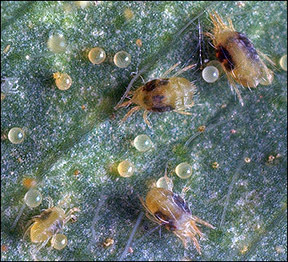 The twospotted spider mite becomes active in spring where they hatch from eggs into larva. At larval stage they have 6 legs and progress through two 8 legged nymphal stages before becoming an adult. The facinating thing about the life stages is that it can be completed in only one week in optimal conditions. To determine if you have mites, place a piece of typing paper under the affected leaves and tap the leaves sharply. If mites are present, many will drop on the paper and start crawling around. They will be as small or smaller than the period on this page. They multiply rapidly and can go from a few mites to thousands in only a short period. Female adults can reproduce with or without the aid of a male which guarantees future generations of spider mites. Twospotted spider mite adults have two tiny spots, one on each side of their body. They have a veracious appetite and can cause plant decline before summer's end. Several years of feeding by the twospotted spider mites can kill or severely weaken trees and shrubs. Mites cannot usually be controlled by general use insecticides. It takes a Miticide to kill mites and miticides can be very expensive. To complicate things, mites can develop resistance to miticides. In addition, most miticides are not available to homeowners, but rather are available to commercial pesticide operators. Talstar is an insecticide/miticide that can be used by homeowners and will offer control of the twospotted spider mite. The female has two resistance genes and the male has one resistance gene. This means the females have a greater chance of developing a resistance to the best miticides. Spray the leaves and stems of plants with a jet stream of water using your water hose. Try to get the underside of the leaves. This will dislodge the mites and eggs and wash off the larva. It is only a temporary solution and it will have to be repeated once or twice a week. However, it will slow down the progress of mite development and slow mite damage.